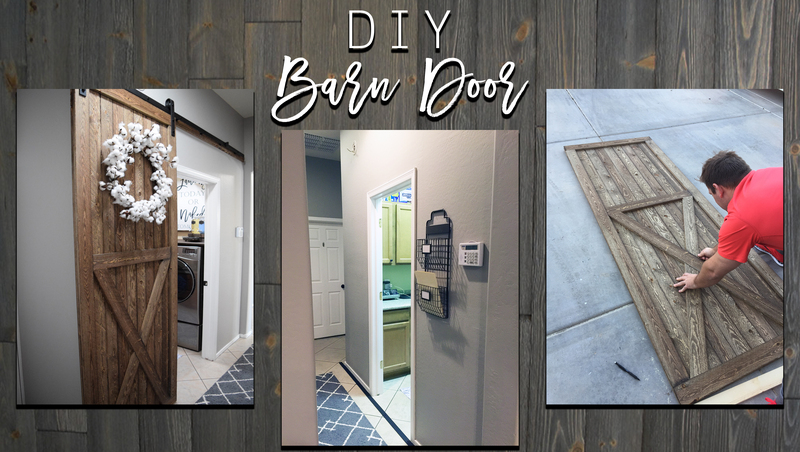 I'm long overdue a blog post and in particular, this post about our barn door that we built a month ago now! If you follow along on my Instagram story, I shared how awkward the doors are leading into the laundry room and furthermore, the garage, as the entrance to it, is right through the laundry room. I know I'm not the only one with this same floor plan, or who feels claustrophobic in the laundry room when both doors open at the same time, right?! 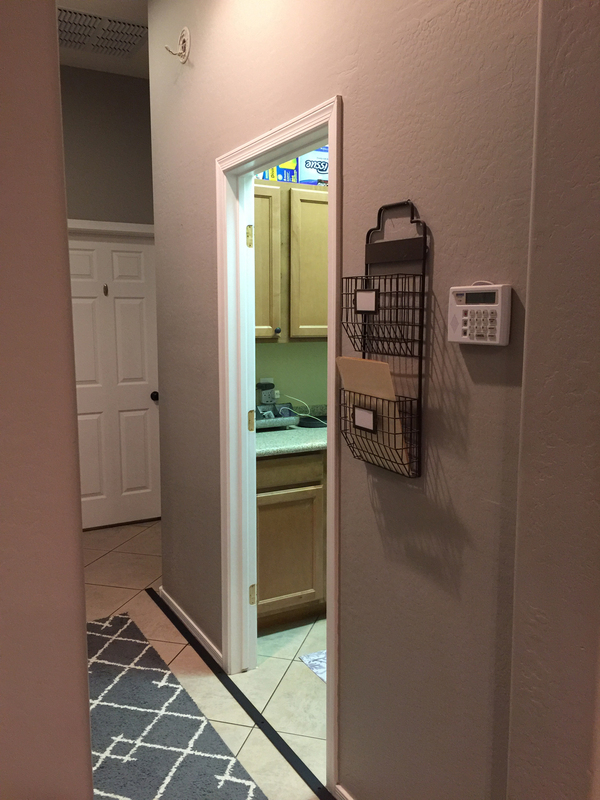 We have counter tops and cabinets installed in ours but they weren't fully utilized due to the current door situation. 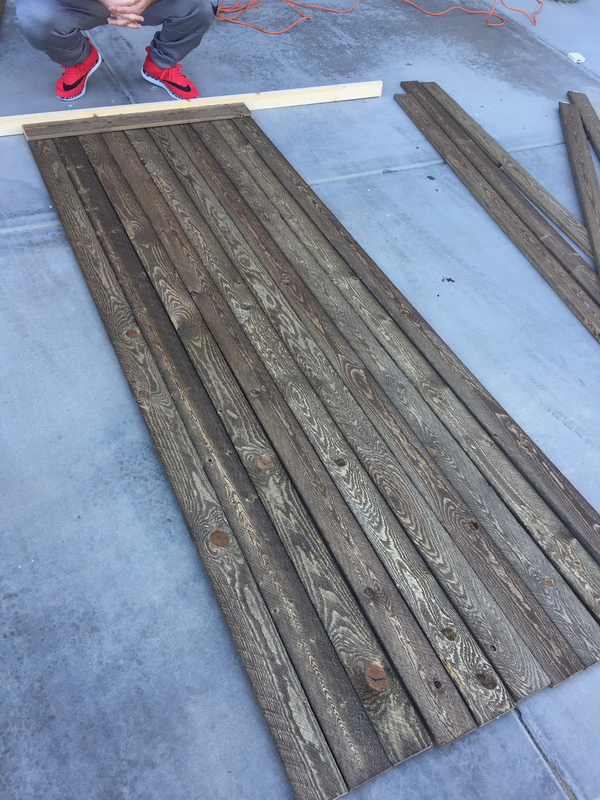 After sharing my predicament, a friend of mine suggested a barn door. I think I had the biggest "AH HA!" moment of my adult life. I mean, how could I not have thought of this sooner? Immediately, I call my husband to get him on board with my latest DIY project (which then turned into a full laundry room makeover! but that's a whole 'nother blog post!) and the rest is history! Here's the hallway and door entrance to the laundry room once we took the door off and before the barn door install. 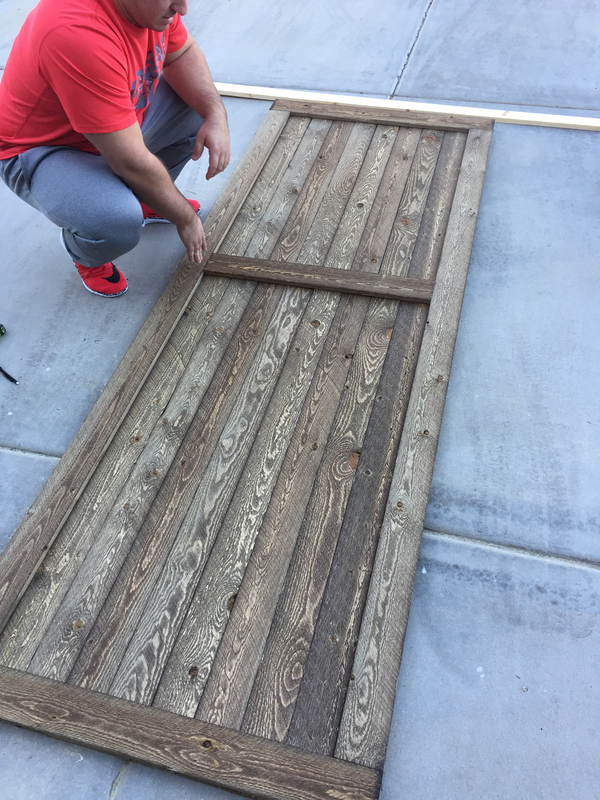 I'll do my best to explain exactly HOW we built this door and what materials we used! We began by measuring the door opening which was 35" wide. 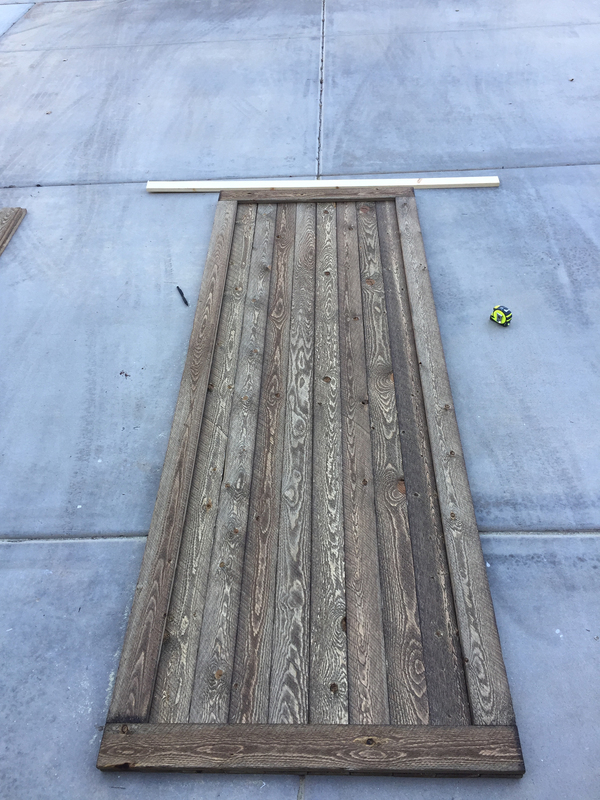 Each piece of the barn wood was 8ft long by 3.5" wide, so we built the door 10 pieces wide, making the door exactly 35" wide too. 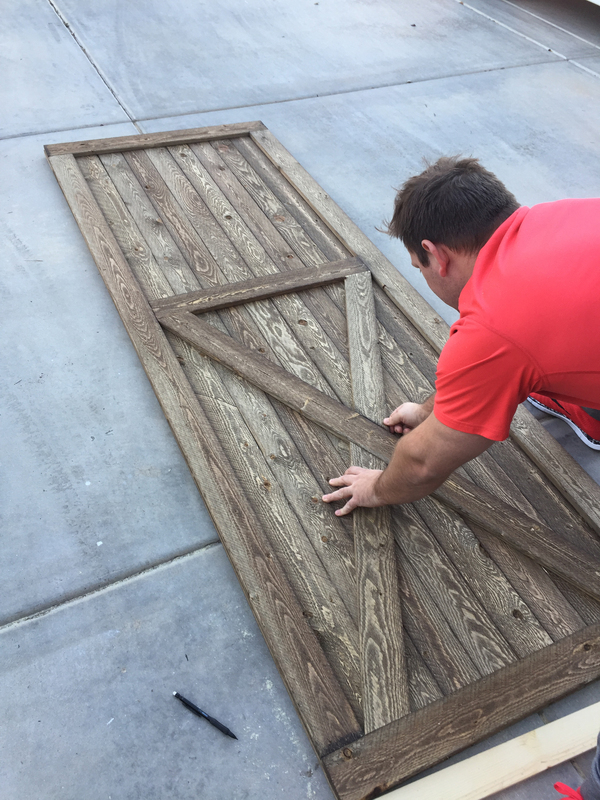 Next, we framed the door by cutting additional pieces of wood and attaching it all the way around with a nail gun and 1 1/2' nails. At this point, your boards will still be unsecured in the middle parts, so we added a diagonal design two thirds of the way down to build support. Start by measuring where the bottom half of the design will start. Attach this piece with the nail gun. Now, using a pencil to mark, lay down the wood for the cross cut pieces. 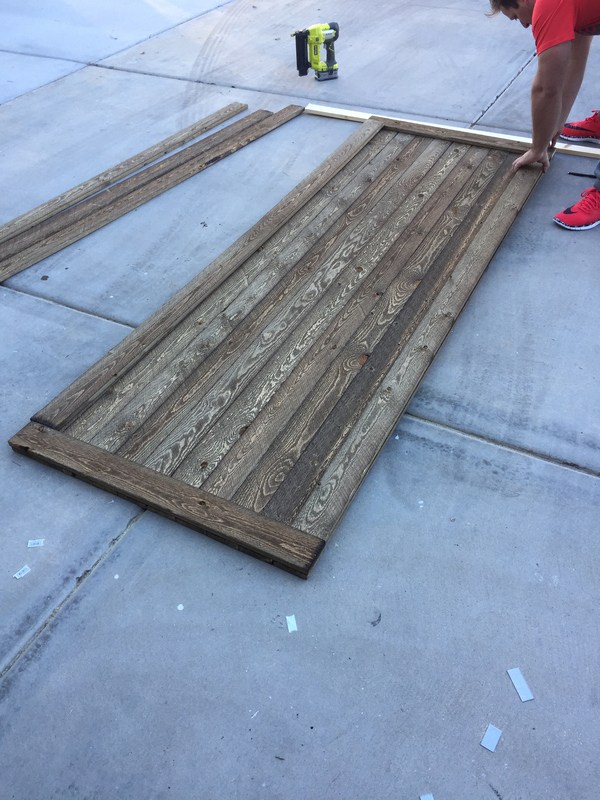 Cut the first piece at an angle and attach with the nail gun. The second piece of wood will be cut into two pieces and cut at an angle. Attach these with a nail gun in the same way. Now, your door will be complete! At this point, you will need to install your barn door track and brackets, using the instruction manual they send you. 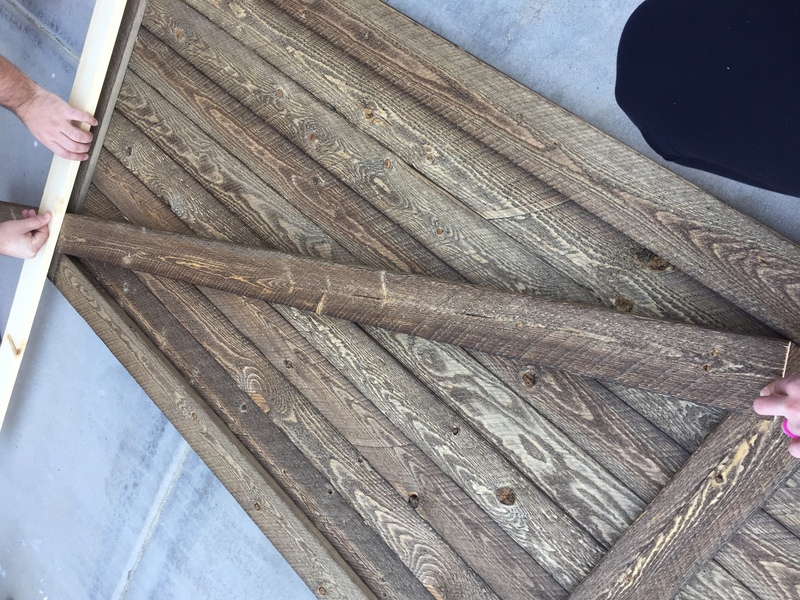 This installation of the door track is by far, the most challenging step. It will require two people. Try to be patient and don't rush this as it is the most important part! After what felt like forever, we finally had ours hung and it couldn't be more perfect! I'm pretty much obsessed! Beautiful right? I couldn't stop staring at it, for almost a week!! 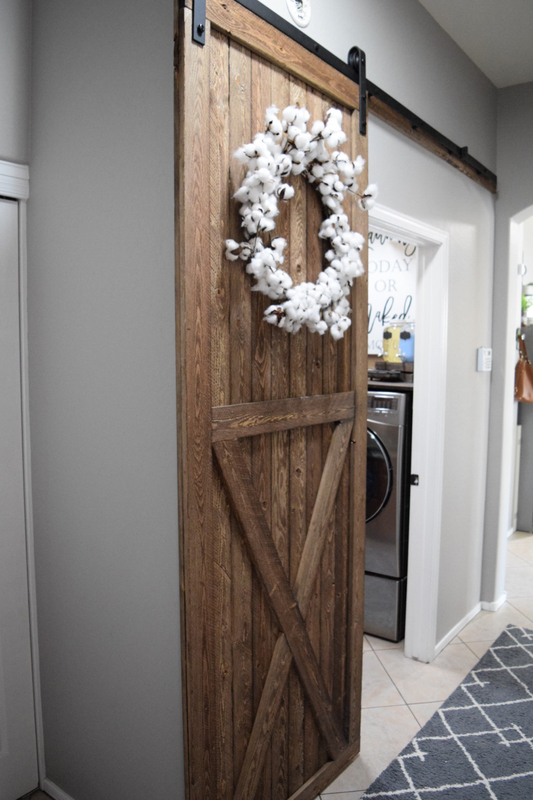 I had always wanted a barn door in my house, and thankfully, I found a perfect spot for one! I couldn't be more excited! 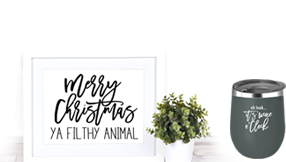 Thanks for stopping by and checking out the blog!